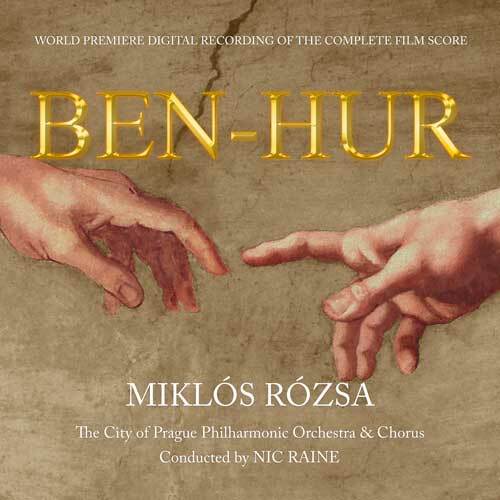 TADLOW MUSIC RELEASES NEW DIGITAL RECORDING OF MIKLÓS RÓZSA’S COMPLETE BEN HUR SCORE. Tadlow Music is one of the preeminent record labels producing and releasing newly reconstructed versions of classic film music, including Miklós Rózsa’s El Cid, Sodom and Gomorrah, Quo Vadis and The Thief of Bagdad. Their latest release is the complete 157-minute score from one of the greatest films of all time – BEN-HUR. The new 2-CD set includes previously unreleased music, re-recorded in stunning and dynamic 24-Bit 96kHz digital sound. The goal of the project was to present the score just as Rózsa intended. To that aim, Tadlow Music founder and producer James Fitzpatrick turned to one of Europe’s most outstanding and virtuoso orchestras, the City of Prague Philharmonic and Choir, under the direction of Nic Raine, who had orchestrated for Miklos Rózsa on some of his later film scores. The reconstruction of the music started with the original version of the sheet music registered by MGM with the Library of Congress. Reconstructionist and Rózsa expert Leigh Phillips combed through these ‘sketch scores’ – the hand-written music Rózsa would have provided to his orchestrator. He looked at the copious notes written on its pages, and began to both interpret the notes and condense them into new, computer-generated sheet music for the musicians to play. In addition to the cues recorded for the film, Phillips included music written for deleted scenes as well as pieces composed, but ultimately not used in the final version of the BEN-HUR. Guided by Rózsa’s sketches, Phillips orchestrated the music for what would ultimately be a 96-piece orchestra and an 80-voice choir, with additional ethnic instruments. Click here for more information about the special edition of BEN-HUR.